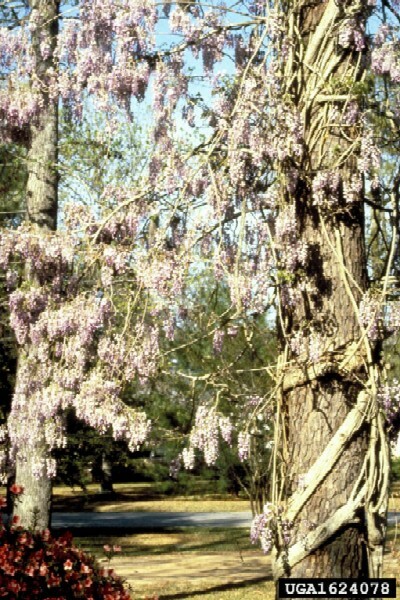 Wisteria sinensis invades forest edges and disturbed areas, including riparian zones. It tolerates shade and a variety of soil types. In riparian areas, it spreads downstream as seeds float to new locations. Most infestations of natural habitats are escaped landscape plantings. Wisteria sinensis remains a popular ornamental in the nursery trade. According to Martin (2002), Wisteria sinensis is a perennial vine that can live for 50 years or more and grows up to 38cm in diameter. The leaves are alternate and pinnately compound. They grow up to 30cm long and consist of 7-13 leaflets. The fragrant flowers are 1.27-2.5cm long and hang in clusters that sometimes exceed 40cm in length. Flowers are usually blue-violet, but other cultivars (which may be escaped plants) are white, purple, pink, and lavender. Flowers are usually produced from April to May (in the North American region). 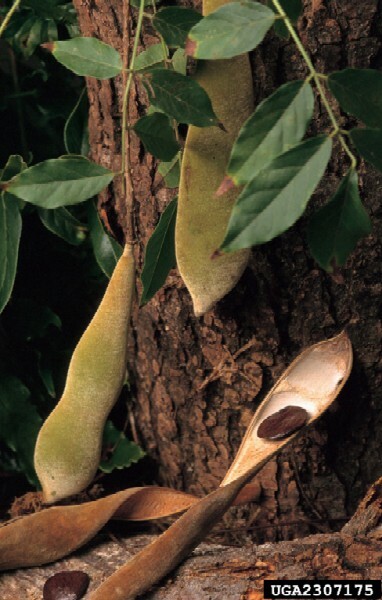 Seedpods are 10-15cm long, hairy, and brown; they are narrow at the base and have constrictions between the seeds. The vine always twines around host plants counter-clockwise. The seeds and pods of Wisteria sinensis are toxic if ingested and may cause nausea, vomiting, stomach pains, and diarrhea (Martin, 2002). Wisteria sinensis has been commonly used as an ornamental. Martin (2002) notes that it has been grown extensively in the United States; since 1816 when it was first introduced (Remaley, 1999), for ornamental uses on porches, gazebos, walls, and gardens. Many alternatives to this vine exist, including American wisteria (Wisteria frutescens), Trumpet creeper (Campsis radicans), Trumpet honeysuckle (Lonicera sempervirens), Dutchman's pipe/pipevine (Aristolochia macrophylla), and Crossvine (Bignonia capreolata). Typically, W. sinensis infests forest edges and disturbed areas (Martin, 2002). 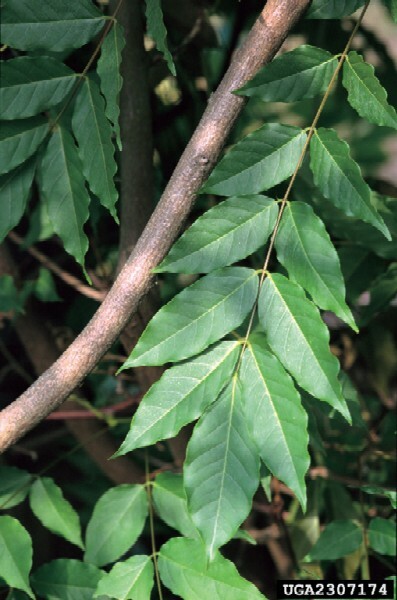 Remaley (1999) notes that it grows best in full sun but is shade-tolerant. W. sinensis can tolerate a variety of soil and moisture types but it prefers loamy, deep, well drained soils. According to Remaley (1999), vegetative reproduction is the primary means of expansion for W. sinensis. In its preferred habitat, however, seeds may be produced, and in riparian areas they may be carried downstream for long distances. W. sinensis is a popular ornamental (Martin, 2002). 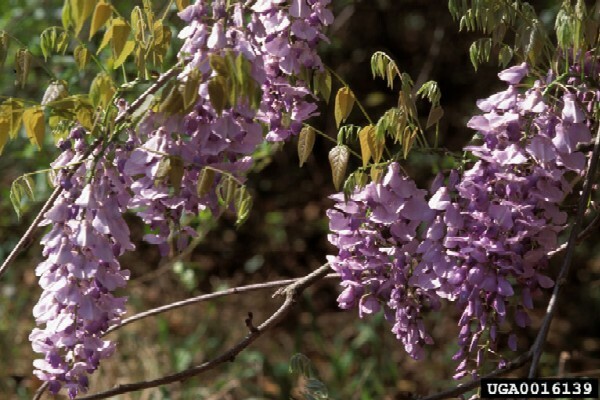 Recommended citation: Global Invasive Species Database (2019) Species profile: Wisteria sinensis. Downloaded from http://www.iucngisd.org/gisd/species.php?sc=287 on 21-04-2019. According to Remaley (1999), native shrubs are overtaken by Wisteria sinensis through strangling and shading. Even larger trees can be killed by this vine, causing large gaps in the canopy when they fall; this open canopy then furthers the growth of W. sinensis. This aggressive vine can form dense thickets allowing little else to grow. This vine has been discovered as a threat not only to the eastern United States, but to the Hawai‘ian ecosystem as well (UHBD, 1998). According to Martin (2002), current management approaches consist of mechanical and chemical methods. \r\nPhysical: Mechanical methods should be used for small populations or where herbicides could damage desirable species. When cutting vines, cut close to the root collar to discontinue growth of existing vines and reduce seed production. W. sinensis will resprout, so it is recommended that the vine be cut repeatedly every two weeks from early in the growing season to autumn. Vines should be removed because they may continue to grow and girdle the host plant. Try to remove the entire plant (including roots) and dispose of all parts because any plant parts left can resprout. \r\nChemical: Cut-stump herbicide applications should be used where there are large stands of established vines or where desirable plants occur and could be affected by foliar spray. Cut the vine close to the ground and apply glyphosate or triclopyr (25% solutions in water) to the cut area. If resprouting occurs retreatment may be necessary. This treatment is not effective if the ground is frozen. Foliar sprays should be used where mechanical controls would be disruptive and cut-stump methods are impractical, but additional precautions should be taken not to harm non-target species. Spray the foliage thoroughly, but do not apply so much that it drips off. Application may be more effective in warmer temperatures (above 60-65 F) because translocation is slower in cooler weather. \r\nTriclopyr is specific for control of broadleaved plants and may be beneficial if protection of valuable native grasses is of concern. Glyphosate is non-selective and should be used with care. Chlopyralid targets aster, buckwheat, and the pea family. However, chlopyralid can seep into groundwater in sandy and limestone soil types. Picloram may provide control in areas where desirable vegetation is not present. There have been successes with backpack-spraying of the base of the trunk of the vine from ground level up to 12-18\" high (depending on the diameter of the vine) and completely encircling the trunk with a mixture of Garlon 4 and Impel Red in a 25%(G4) to 75%(IR) mix ratio. Impel Red is a mineral oil that seems to provide good penetration of Garlon 4 (Lorraine Miller. pers. comm., 2003). Informations on Wisteria sinensis has been recorded for the following locations. Click on the name for additional informations. Martin, Tunyalee. 2002. Weed Notes: Wisteria sinensis (Chinese Wisteria) Wisteria floribunda (Japanese Wisteria) . The Nature Conservancy: Wildland Invasive Species Team [Online database]. Summary: Detailed description, distribution, biology, similar species description, alternative ornamental plants, and control measures used. Available from: http://tncweeds.ucdavis.edu/ [Accessed 16 April 2003]. Atlas of Florida Vascular Plants, 2003. Institute for Systematic Botany. UHBD (University of Hawaii Botany Department). 1998. Wisteria sinensisSweet. Hawaiian Alien Plant Studies [Online database]. 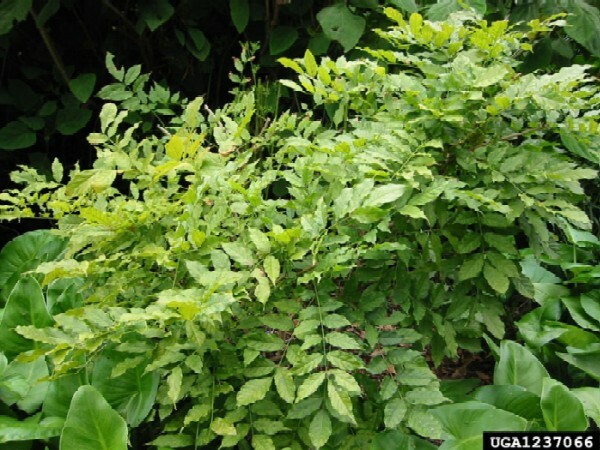 Summary: W. sinensis is included on the list of Pest Plants of Hawaiian Native Ecosystems. Available from: http://www.botany.hawaii.edu/faculty/cw_smith/aliens.htm [Accessed 19 April 2003]. Wunderlin, Richard and Hansen, Bruce. 2002. Wisteria sinensis Institute of Systematic Botany: Atlas of Florida Vascular Plants [Online database]. Summary: Detailed taxonomy and Florida distribution.